Who knew that lemon pudding can actually help you manage arthritis? Joint pain is not only extremely painful, it is also frustrating because it can limit your quality of life. Your joints form a vital connection between your bones. Injured or damaged joints can make movement exceedingly difficult and ultimately wreak havoc on your day-to-day life. Whether a result of an injury or illness, the ensuing inflammation and pain can become chronic and debilitating. As much as 33 percent of the population experiences mild to debilitating joint pain on any given day (1). Traditional medicine typically offers anti-inflammatory medications to deal with the pain, which come with a slew of nasty side effects. While these drugs may address this issue, the underlying cause(s) of the inflammation are rarely investigated, leaving people dependent on medications to simply get through the day. And what’s worse, over time, these toxic drugs only exacerbate inflammation and leave you lost in an endless cycle of pain and frustration. But there’s hope. Holistic doctors and nutritionists have been touting the power of whole foods for centuries. After all, nature is truly the world’s biggest and most complete medicine cabinet. Unlike the symptom-oriented mindset of conventional medicine, natural medicine targets the root cause of illness while nourishing the body from the inside out. And when it comes to joint pain and inflammation, whole foods can be a true catalyst for healing. 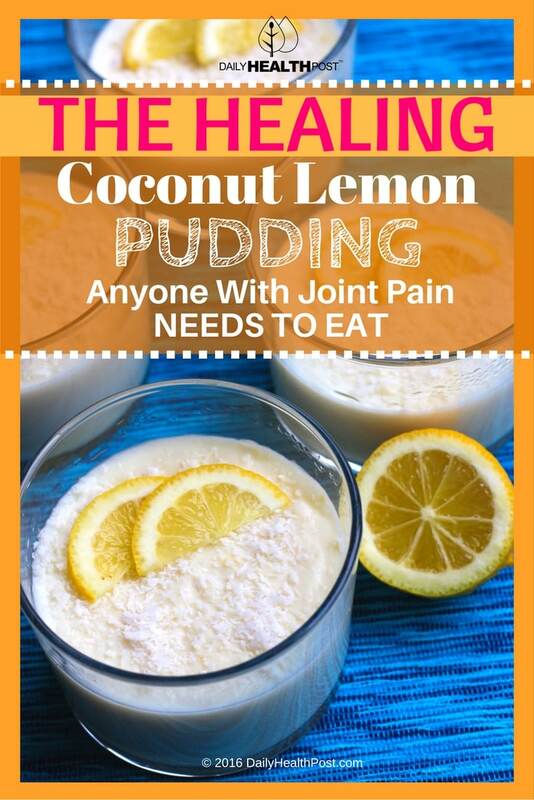 To get you started, here is a delicious joint healing lemon pudding recipe that will help to keep you moving all day long. 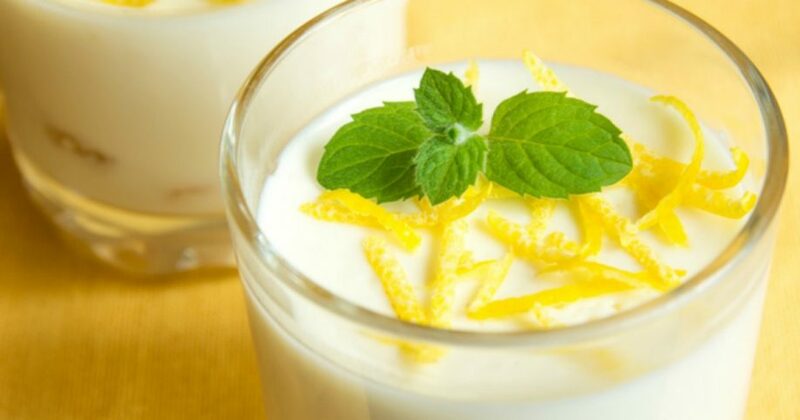 This tropical lemon pudding will lubricate your joints and help heal injured cartilage. Pour ½ cup water in a saucepan and sprinkle in the gelatin. Set aside until the gelatin becomes soft and spongy (about a few minutes). In a mixing bowl, add the lemon juice,coconut milk, and vanilla. Heat the gelatin mixture on low just until the gelatin is dissolved. Remove from heat and stir in your sweetener. Whisk the gelatin into the lemon mixture. Divide your pudding between 3-5 small glasses and chill until set. *Vegetarians and vegans can substitute gelatin for 3 tbsp. of agar powder or agar flakes. This simple lemon pudding is nothing without these star ingredients! This milk is full of protein and beneficial fats in the form of medium-chain fatty acids (MCFAs). MCFAs are much easier for your body to break down than long-chain fatty acids (LCFAs) like those found in vegetable or seed oils. As such, MCFAs are converted to energy instead of being stored as fat like LCFAs. MCFAs are also one of nature’s best anti-inflammatories. Studies even show that their anti-inflammatory powers reach beyond your joints and can even help with intestinal inflammation (2). The lemon juice in this recipe also works to heal inflamed joints by providing a rich source of vitamin C and citrus bioflavonoids. Together these potent antioxidants work to boost your immunity, energy levels and detoxify your body, thus reducing inflammation (3). When it comes to arthritis, studies also show that vitamin C-rich foods, such as lemons, provide protection against inflammatory polyarthritis. This lesser-known disease is a form of rheumatoid arthritis that affects two or more joints (4,5). As an added bonus, lemons are known to help boost metabolism, thus helping you lose weight and ease pressure off your joints. Studies further show that specific compounds called limonoids in lemons and other citrus fruits can help fight cancers of the mouth, skin, lung, breast, stomach and colon (6). Some studies suggest you should drink a half cup of freshly squeezed lemon juice mixed with water every day. This raises citrate levels in your urine and prevents kidney stones (7). Gelatin is full of amino acids, minerals, and protein. One of the many benefits of gelatin is that it is a key source of amino acids such as glycine that strengthens your gut lining and lowers inflammation and can even prevent leaky gut (8). Studies also show that gelatin can help people who are suffering from joint and bone pain and related issues such as osteoarthritis, osteoporosis, and even soreness associated with exercise or injury (9,10). Other studies show that the high collagen content in gelatin is beneficial for skin renewal and regeneration (11). Of course, vegans can make their own version of this lemon pudding, but it won’t have the same joint-healing effects.